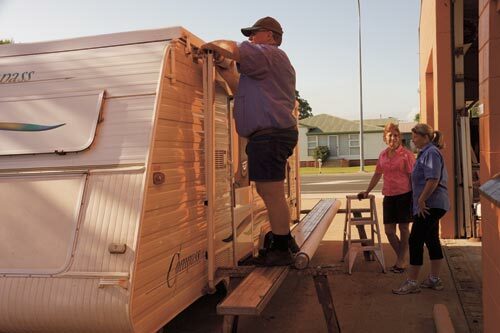 When Denyse and I had our caravan built in April 2001, we asked for a Dometic 8300 roll-out awning to be fitted to the top of our pop-top caravan wall, rather than to the pop-top roof. 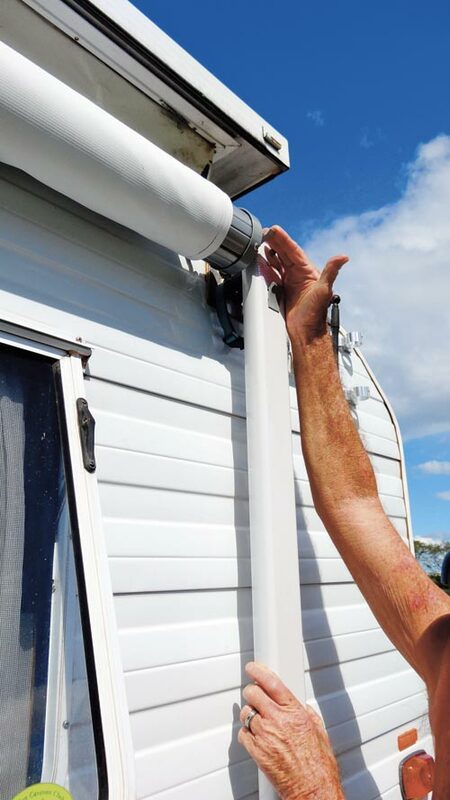 This has several advantages, such as less windage, you don’t have to loosen the awning to pop the roof, and hot air from under the awning does not go back into the caravan through the vent in the vinyl. along with very heavy tropical rain and unrelenting UV radiation from the sun. We have always cleaned the vinyl with a mild detergent, being particularly careful to remove leaves, fruit and bird and bat droppings quickly to avoid staining. Using strong chemicals, especially bleach, can damage the vinyl skin and weaken the stitching. We protect the arms from stone chips and mud with a cover (now available from Vans Eleven) while travelling. Denyse made a vinyl cover for the front of the awning barrel to prevent rain getting in while travelling and this also stops wind catching the vinyl if the awning is at all loose. We also use webbing dog collars around the top of the awning arms to secure them in case the holding clips fail, although they never have. To stop water coming through the stitching holes at the top, and also to protect the stitching from the weather, we use a wax stick, available from camping shops. We also regularly lubricate the slides with silicone, although Dometic recommends WD40 or similar. 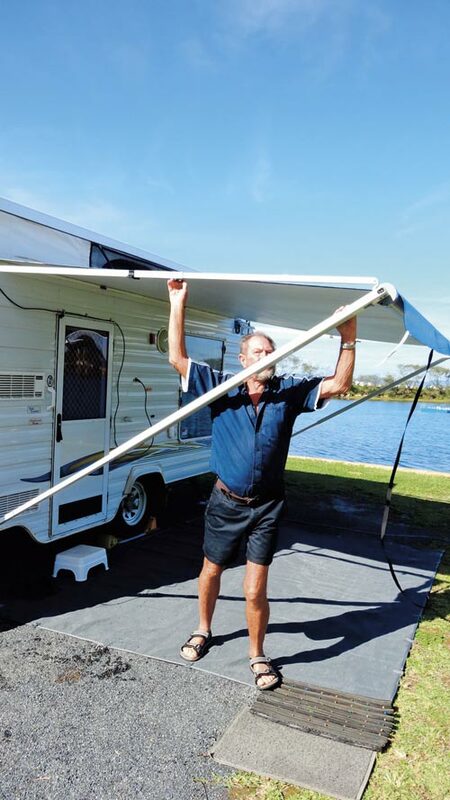 Each year, when we have the caravan serviced, we have the awning serviced as well. This includes checking the operation plus lubricating moving parts. I think this has contributed to the great service the awning has given us over the years. After about eight years, a branch fell through the awning so we had a new barrel and vinyl fitted. One of the sliders in the arms broke about the same time and that cost about $20 to replace. 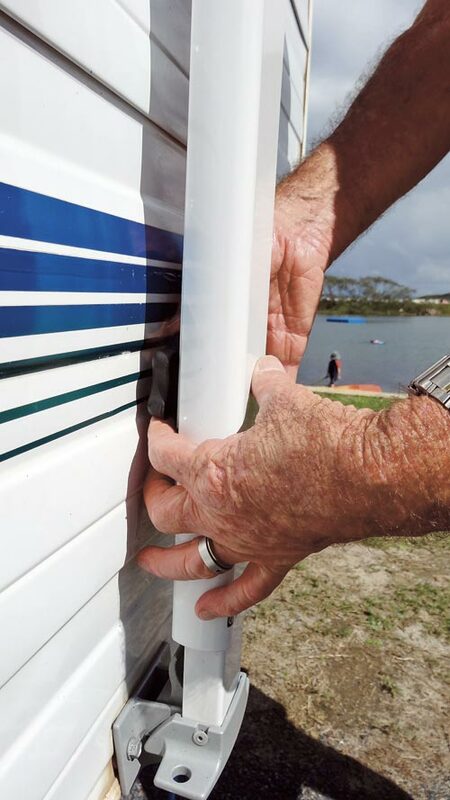 More recently, we noticed some looseness in the lever that controls the opening and closing of the awning, and the barrel jammed a few times, making it very difficult to roll up the awning. After talking to a dealer, we found it was just a matter of manually rolling the barrel down firmly another notch to release it. I wonder how many others have had that problem and not known what to do. These problems are the result of general wear and tear, which is not surprising after the life it has had on the road. This year, however, we had noticed it was a bit stiffer to operate. Denyse is a stickler for having everything just right, and preventative maintenance is our thing, so we decided to get a whole new awning and hardware. After the terrific run we have had over 12 years, we chose another Dometic awning. 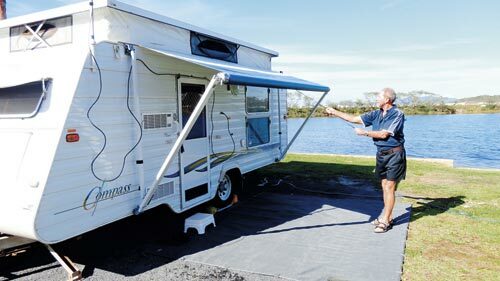 The new awning was delivered to our local dealer, Tullmack Caravans (07 4952 3274) in Mackay, Qld, only two days after ordering it. They removed the old one and fitted the new one while we watched. The whole procedure only took an hour or so and owner Greg Adair’s experience made the whole job look very easy. He was assisted by Heather, and the two of them did the job in a very professional manner. We were given a run-down on the new awning and then asked to operate it ourselves before we left their workshop. Their fitting charge was reasonable, and they made an appointment to fit it at a time that suited us. There are a few differences from our old one: the most noticeable is the colour pattern. The holding brackets for the arms are also different. Fortunately, Tullmack had some original brackets in stock so we were able to use the same screw holes, as I hate drilling more holes in the van. 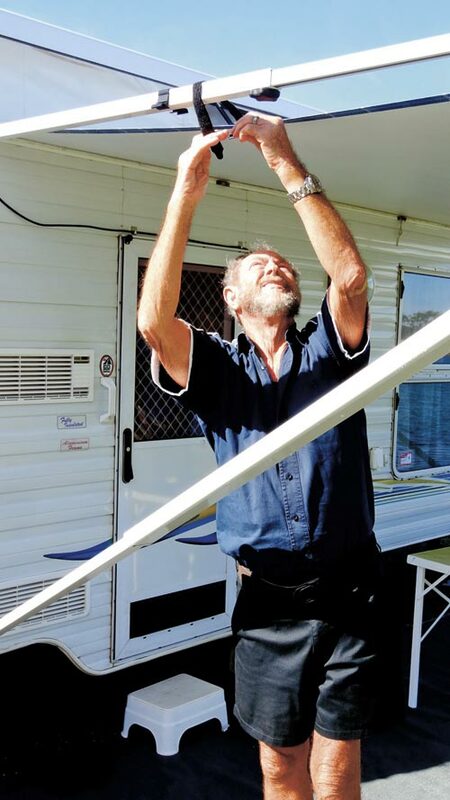 Greg suggested using our two roof rafters to aid water run-off, and drilled the holes in the new roller for them, but we have never used them on our previous awning. After several days of rain using the new awning, the water ran off just fine without having to fit the roof rafters. 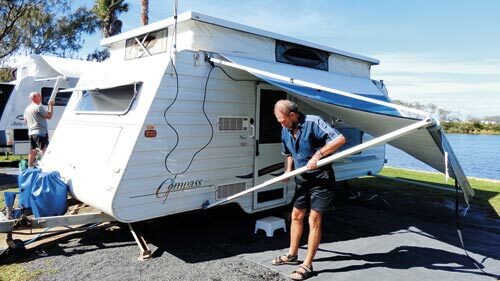 I think, with a smaller awning such as ours, if you make sure it is tight, using anti-flappers on the ends, you will be fine. Just make sure you leave one end one hole lower, so water will run off that end. We always use guy ropes on the awning to stabilise things in rain and wind, although Dometic advises that guy ropes are necessary only if the legs are vertical. 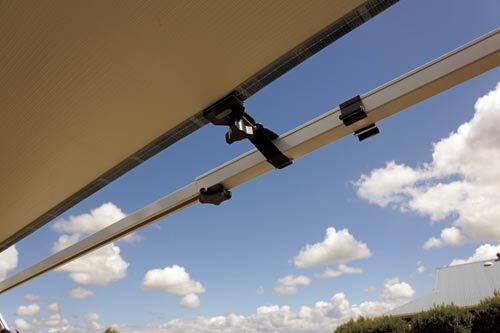 Roof rafters do tend to stretch an awning and, once used, you should continue using them. We have seen several awnings collapse under the weight of rain water! Side and end walls can be fitted to make a full annexe. In our case, Denyse has made shadecloth walls for both the side and end which we use only in very hot weather, as we feel we do not need a full annexe. Rope was sewn into the top of the side wall, and slides into the track on the roller. Denyse also stitched part of a flat nylon shoe lace onto the lower edge of each side of the awning flap, which we tie to the guy ropes to stop flapping in strong winds. Constant flapping can cause tears where it joins into the roller barrel. So far we have used this new Dometic awning for two months, and we are very happy with it. Denyse can roll it up or pull it out easily by herself, and we know from our previous experience that it should last a long time. 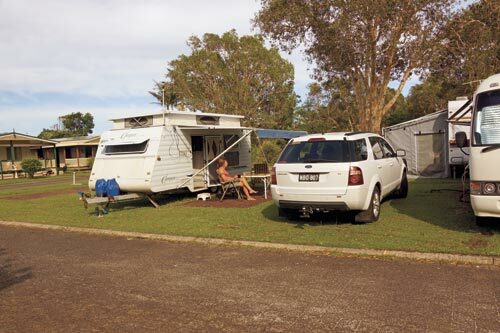 In fact, going on previous experience, it will probably outlast our caravan. 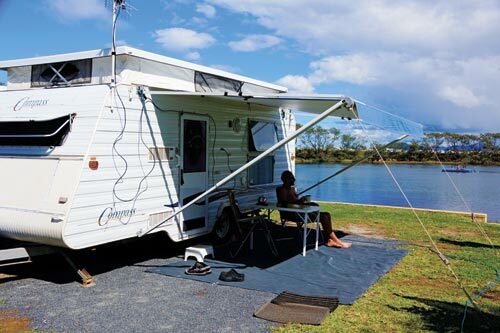 Originally published in Caravan World #516, July/August 2013.